The sacred has an educational function, and its disappearance inevitably impoverishes the culture, in particular, the formation of the new generations. 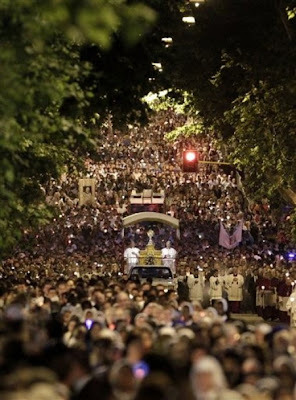 If, for example, in the name of a secularized faith, no longer in need of sacred signs, this citizens' processions of the Corpus Domini were abolished, the spiritual profile of Rome would be “leveled,” and our personal and community conscience would be weakened. Or let us think of a mother or a father that, in the name of a de-sacralized faith, deprived their children of all religious rituals: in reality they would end up by leaving a free field to so many surrogates present in the consumer society, to other rites and other signs, which could more easily become idols. God, our Father has not acted thus with humanity: he has sent his Son into the world not to abolish, but to give fulfillment also to the sacred. At the height of this mission, in the Last Supper, Jesus instituted the Sacrament of his Body and his Blood, the Memorial of his Paschal Sacrifice. By so doing, he put himself in the place of the ancient sacrifices, but he did so within a rite, which he commanded the Apostles to perpetuate, as the supreme sign of the true sacred, which is Himself. 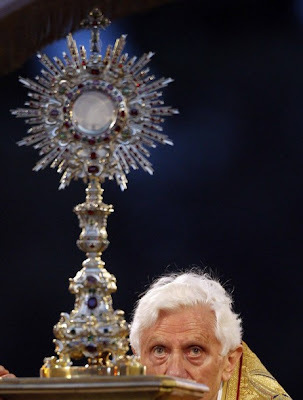 With this faith, dear brothers and sisters, we celebrate today and every day the Eucharistic Mystery and we adore it as the center of our life and heart of the world. Amen. Would you honor the body of Christ? Do not despise his nakedness; do not honor him here in church clothed in silk vestments and then pass him by unclothed and frozen outside. Remember that he who said, ‘This is my Body’, and made good his words, also said, ‘You saw me hungry and gave me no food’, and, ‘in so far as you did it not to one of these, you did it not to me’. In the first sense the body of Christ does not need clothing but worship from a pure heart. In the second sense it does need clothing and all the care we can give it. What is the use of loading Christ’s table with gold cups while he himself is starving? Feed the hungry and then if you have any money left over, spend it on the altar table. Will you make a cup of gold and without a cup of water? What use is it to adorn the altar with cloth of gold hangings and deny Christ a coat for his back! What would that profit you? Tell me: if you saw someone starving and refused to give him any food but instead spent your money on adorning the altar with gold, would he thank you? Would he not rather be outraged? Or if you saw someone in rags and stiff with cold and then did not give him clothing but set up golden columns in his honor, would he not say that he was being made a fool of and insulted?